It’s only a few weeks until the release of oft-delayed The Last Guardian, the third in a series which is undoubtedly a game animation masterwork – always pushing the envelope in believable characters full of personality with convincing interactions between one another. 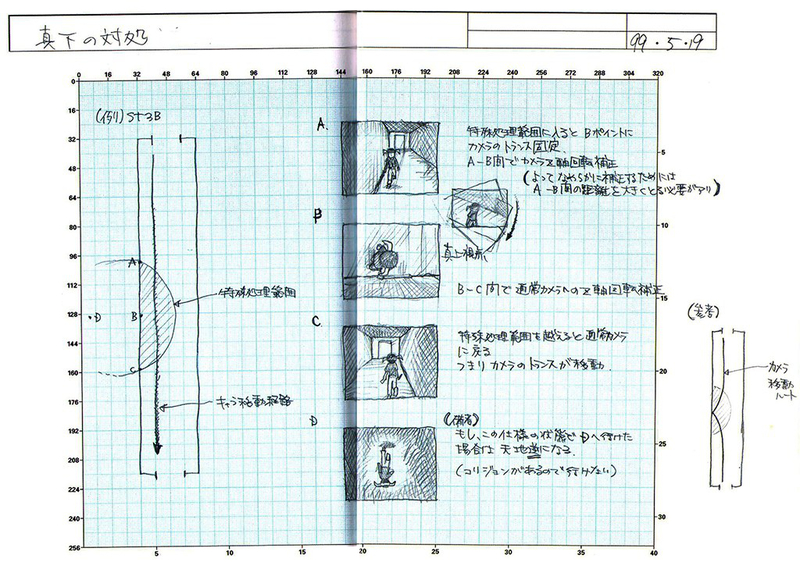 Images are taken from the Japanese Ico / Wanda and The Colossus HD box set. A huge thanks to my colleague Mari Kuwayama for translating the image text. 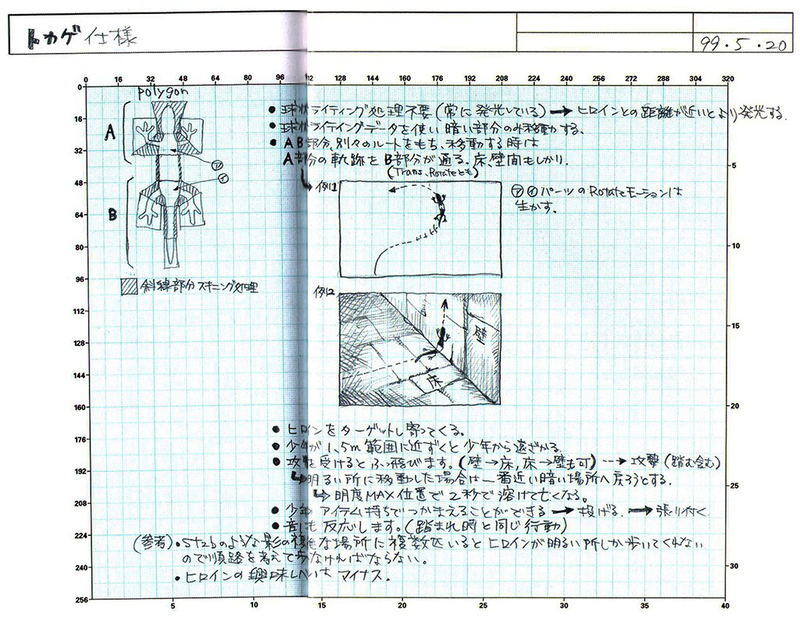 Additional images are via the official Japanese Ico Art Book, scanned by multiplayer.it. 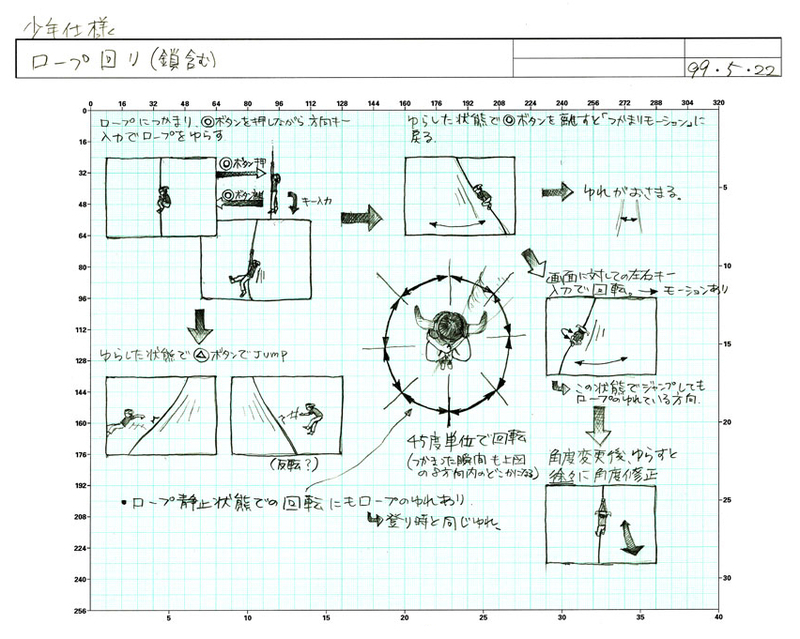 Gameplay possibilities when navigating ropes, such as allowing the player to rotate around by turning every 45 degrees or jumping via the triangle button. 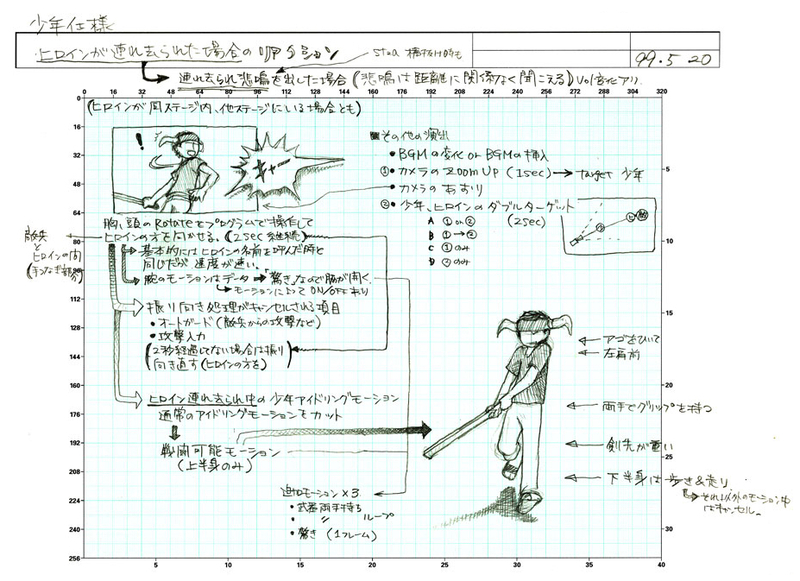 Visual direction for the combat pose, ensuring the weapon is gripped with both hands and has weight. 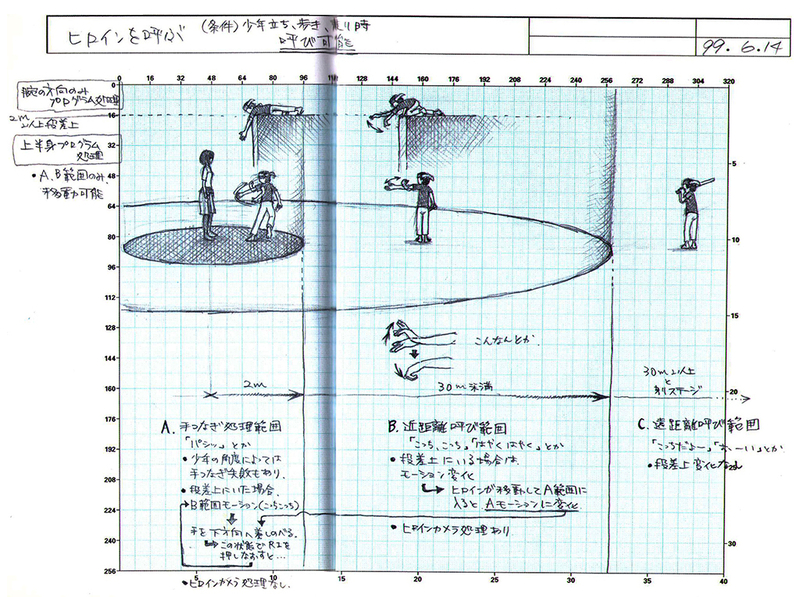 The upper-left image describes Ico’s reaction when the heroine Yorda is abducted by enemies. Different hand and arm gestures to call Yorda from various positions and from different distances and heights. A top-down diagram illustrating camera behaviour relative to the player’s position. 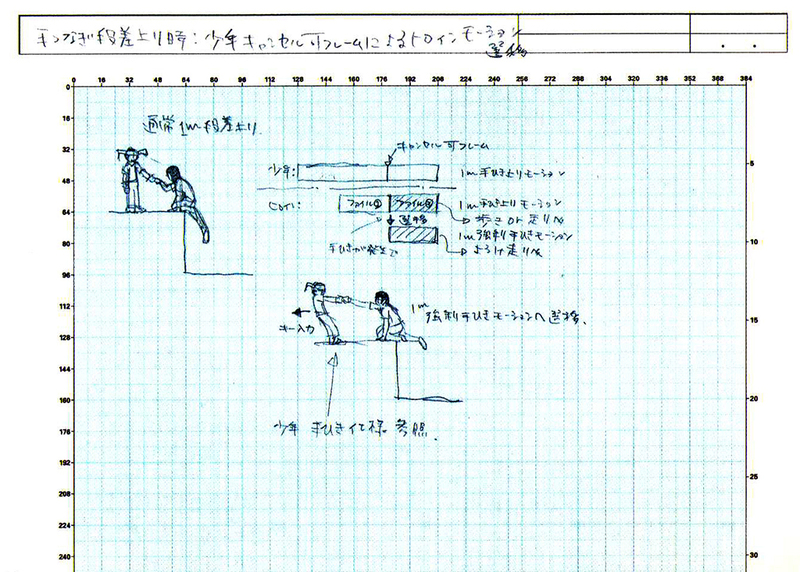 Poses for pulling Yorda over ledges, including instructions on where to cut animations. 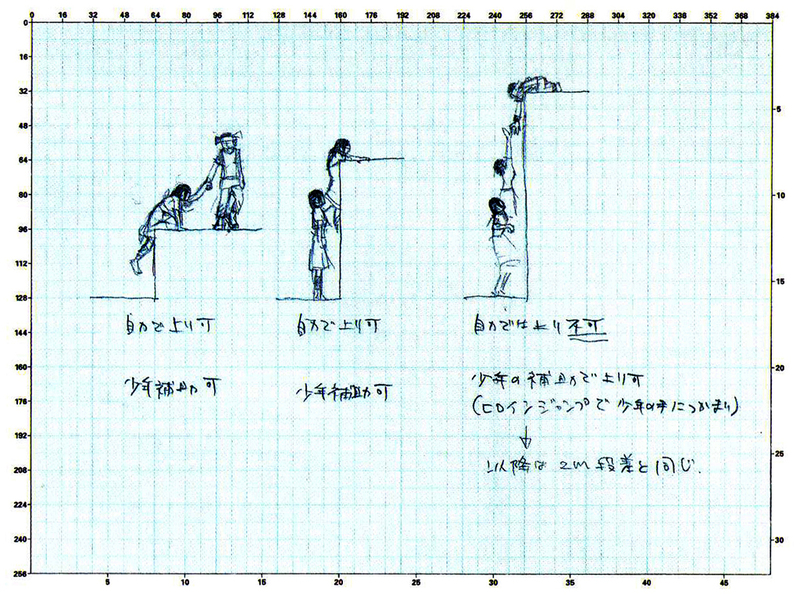 Pulling Yorda over ever-increasing heights, as well as heights she can climb herself. 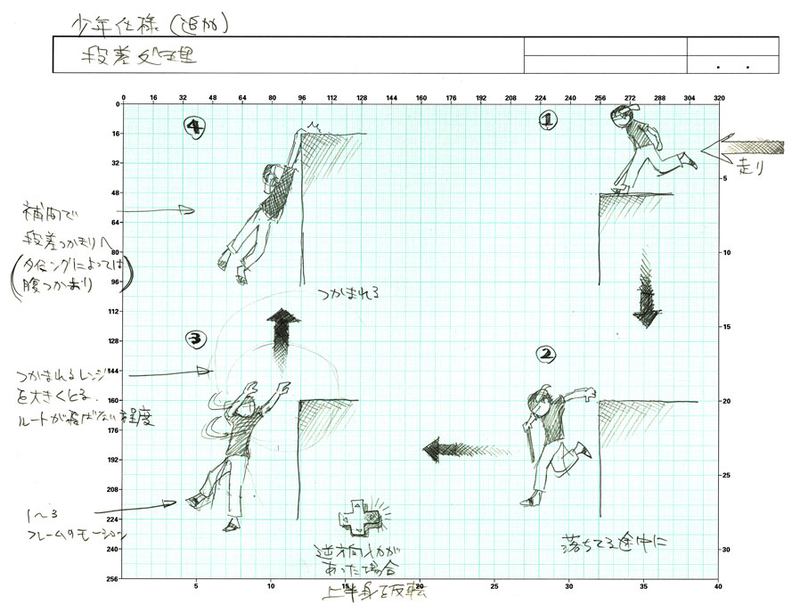 Diagram of arm range-of-motion and limit information for the IK setup required for holding Yorda’s hand. Poses when catch Yorda after jumping over a gap. 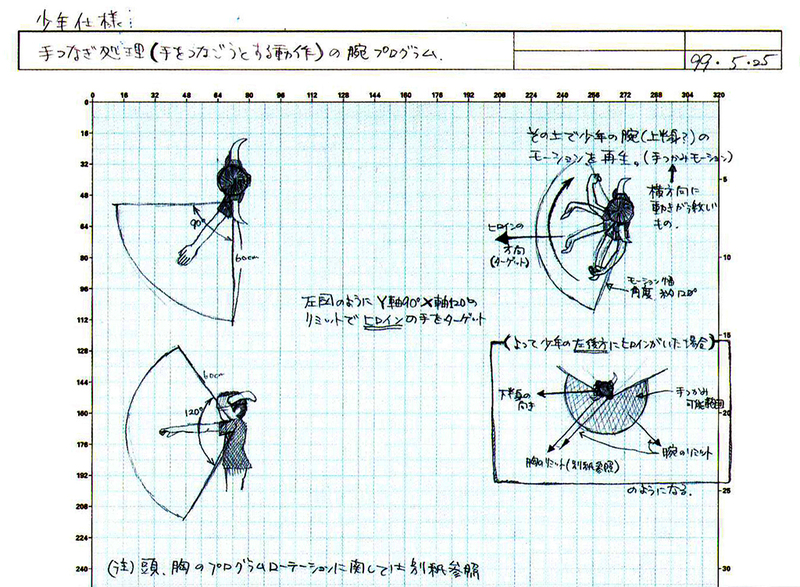 Ico doesn’t have enough strength so drops to the ground, and she swings if there’s no wall. Depiction of how Yorda would open gates, including how they glow and move. This bat perhaps eventually became the flying shadow creature. Reacting to sound and attacking within 5 metres, the image illustrates its weak flapping motions. Lizards only appeared in the follow-up, Shadow of The Colossus. Among several gameplay instructions was the idea that they might distract Yorda’s attention away from the player. Candles scattering after chandelier collpase. 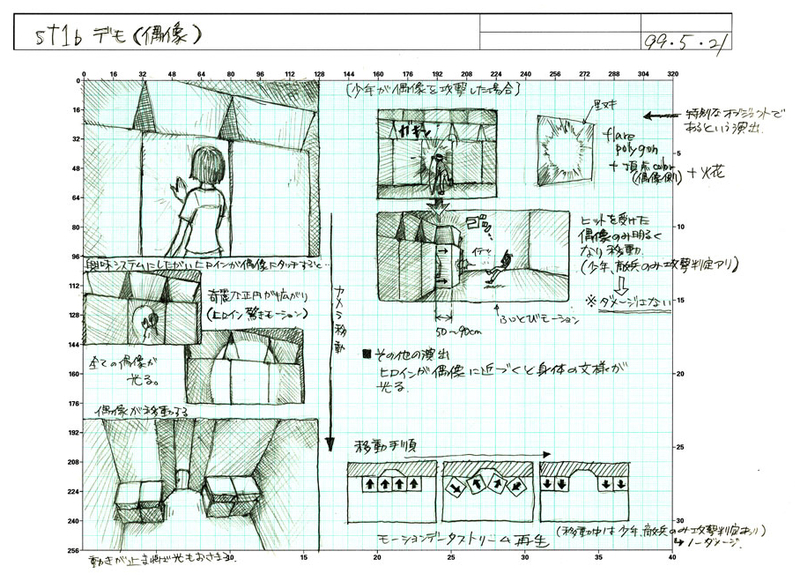 A complete storyboard of the sequence introducing Yorda to the player, including both cinematic and gameplay elements. 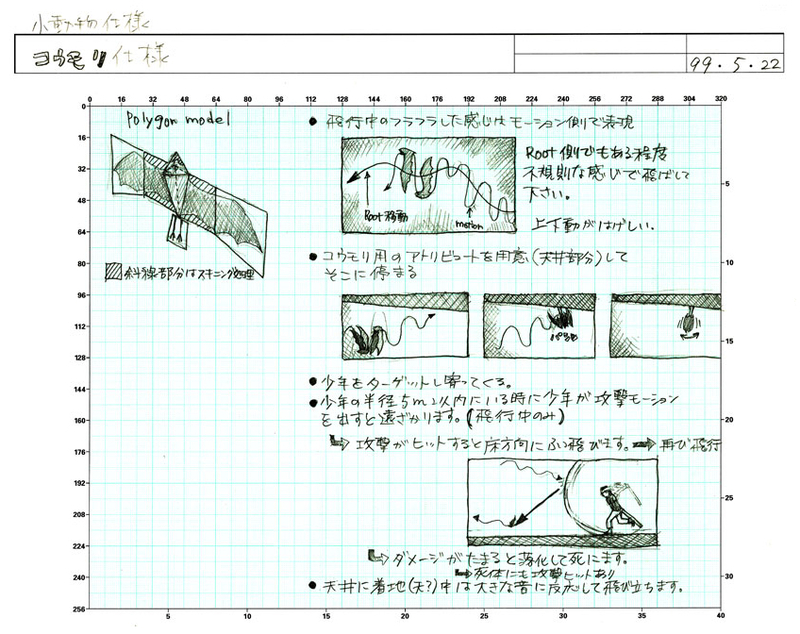 Rough storyboard from when the team was considering online elements, bearing a lot of similarity to the initial pre-visualisation video of Shadow of The Colossus. 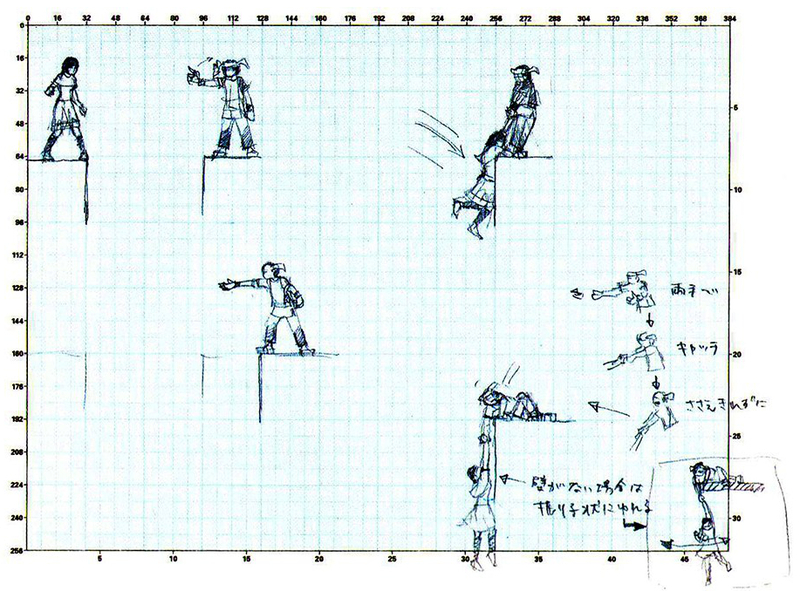 See a breakdown of the animation, (including the original pre-vis), from that game here.